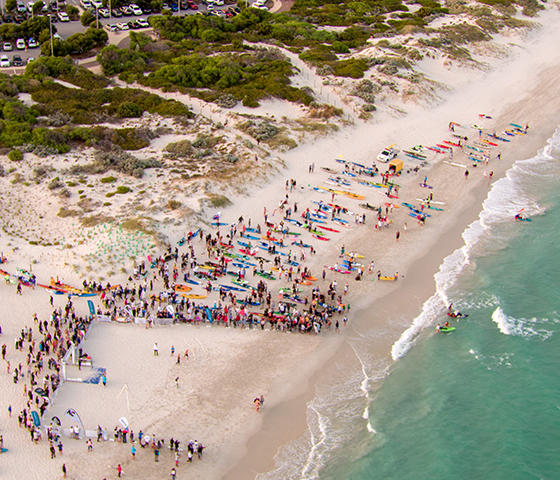 Fremantle-based Blue HQ Marinas is back on board as a sponsor for the 2019 Port to Pub swim. Dry Stacking: Designed to help boat owners to save time, avoid busy boat ramps and mostly, offer a safe and convenient place to store their boat. Simply book you launch, arrive to your boat in the water, iced up and ready to go. Your boat can be ready to go at any time, day or night. Upon return simply tie up, head home and let Blue HQ’s friendly and experienced staff do the rest. Private Marina: 18mt, 25mt and 40mt pens available. Blue HQ’s marina consists of state-of-the-art floating jetties with a maximum walk of 100mt from your car to your boat. Pen packages include ocean side pen, undercover parking, private storage garage, access and a private function at ‘The View’ luxury clubhouse, annual lift & hardstand, dry stack tender storage. The marina is manned seven days a week with staff on hand for your every need. Boat Lifters - Repair and Maintenance Facility: Situated in the heart of Fremantle, Blue HQ has three marine travel lifts ready to haul your boat for regular maintenance works, annual haul out, or in case of emergency. Blue HQ engages Fremantle’s best and most recognised marine trades to ensure you haul out visit is efficient, cost effective and has lasting results. Its staff are on hand ready to service your every need. The View: Blue HQ’s luxury marina lounge and viewing deck: With views over the Fishing Boat Harbour and the Indian Ocean this is like no other spot in Fremantle for watching the sunset. The View was built in style and elegance with a layout perfect for entertaining 30-175 guests. Private and corporate memberships are available that include year-round access as well as a number of private functions. Perfect for weddings, Christmas parties, birthdays, product launches, AGMs and offsite meetings. Boat Sales: Blue HQ has Fremantle’s biggest display yard right next to Little Creatures. We sell clients and outside boats on consignment. Come down to have a chat to our experienced broker and find a boat that suits you. If Blue HQ can be of assistance in the lead up or post the Port to Pub swim please contact the team on (08) 9335 3475 or info@bluehq.com.au. Be sure to mention you are part of the Port to Pub, so Blue HQ can extend a discount to you. The Blue HQ team wishes all swimmers, paddlers, support crew and skippers the very best of luck for the 2019 Port to Pub. Blue HQ will be providing the official boats on the day, so if you need anything please do not hesitate to ask!